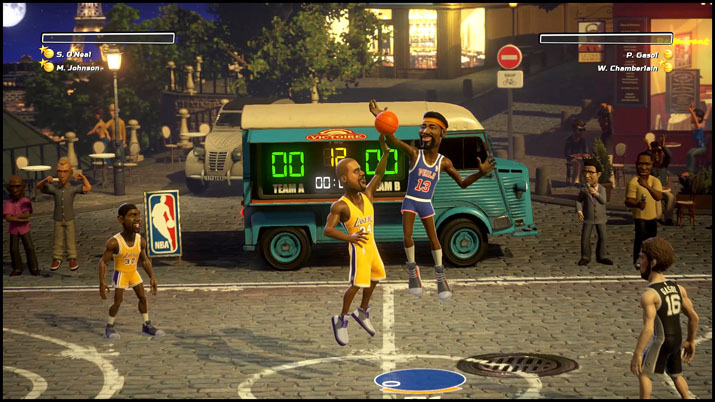 NBA Playgroundsis a 2vs2 basketball game that, at its best, provides some over the top arcade experience that can be highly entertaining, hilarious and even addicting to play. In fact, the action can be so over the top that during my first couple of games I lost track of what was happening. I was laughing wholeheartedly at the hilarity of some of the animations instead. The controls are easy to grasp and hard to master, and the game works perfectly well with an Xbox controller. Although there is some talk about problems with other controllers, but these can apparently be solved by following the developers’ instructions on Steam forums. The action unfolds on one of eight playgrounds, all of them colorful and detailed in design, where you face your opponent’s selection with two players of your choosing. Other than making baskets, your main concern will be to fill up a power-up meter, which is conveniently accomplished by being an awesome superhuman athlete. Dunks, steals, blocks, and alley-oops all add to the meter, which in turn grants a variety of bonuses like balls that never miss, speed boosts or point multipliers. Prior to choosing your favorite players, you have to unlock them. This is done by earning and opening silver or gold card packs, which adds a collective element to gameplay. To further keep you grinding, players can be leveled up individually. The process from beginning to end takes about 10-20 games per character, unlocking new special moves in the process. Earning players in the first place is easy enough by winning online games or by playing through the single player campaign, where each win gives you XP and new card packs, eventually. Thankfully, there is no shortcut via microtransactions, so playing the campaign (or getting owned online) does make a lot of sense for the first couple of hours, because it’s a fun way to get good, to get more players cards, and to level up your favorite toons. Player selection covers about 250 stars and superstars, from bygone legends like Bill Russell and Wilt Chamberlain to future hall-of-famers like Steph Curry and LeBron James, with the notable exception of Larry Bird and Michael Jordan who seem to be missing as of yet. Not all players are created equal, though. There are common, epic and legend players, and stat-wise, there is much variety, offering some room for experimentation with different player combos. If you’ve read this far, you’ll probably think “Wow, sounds great!” – awesome presentation, great player selection, no microtransactions, fun and motivating gameplay, what’s not to like? And while there is everything to like for the first couple of hours, I am not so sure about the longevity of NBA Playgrounds. Rather disappointingly, there are problems. The biggest is consistency. If everything goes according to plan – punch KD in the face, steal the ball, do a crossover, then a pump fake, to ultimately HAMMER DOWN that alley-oop – you’ll be cheering and fist-pumping till your rings come off (if any). But pulling off such fireworks can be irritatingly inconsistent. So you practice, right? And that’s the problem. There is no practice mode. The closest thing you have is an “exhibition game”, but that mode isn’t ideal to practice your shot timing on jump shots, layups and dunks. Getting the timing right, however, is important, because making a shot with perfect timing is awarded with bonus points. Practicing dribbling and the semi-broken alley-oops would also be useful, because players move with lightning speed and it takes practice to guesstimate where they will end up after performing a dribble move (or when your AI teammate will actually jetpack towards the hoop for that alley-oop you’ve been trying to trigger for more than 5 seconds now). Making jump shots or dunks is yet another basket of fishy surprises. At times I released at the top of my jump, to get that perfect release. Sometimes, on turn-around jump shots for example, I released before my player even left the ground and still made the basket. Among the Steam community, confusion is clearly expressed about the correlation between animations and the timing of these releases, and the studio Saber Interactive has already hinted that revisions might be incoming to make the shooting less erratic. Where are the game modes? 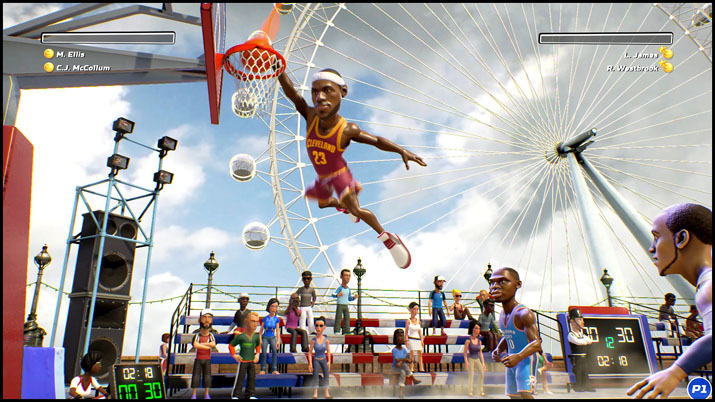 Entertaining games like NBA Playgrounds excel when played with friends, be it online or at home on the couch. Disappointing then are the multiplayer modes. They lack variety and feel feature-starved. The main mode is to play online versus random opponents. The other is a local multiplayer, possible with two controllers, but that currently has no option for coop, and no challenging of friends for an online match. On the positive side, additional options, such as online tournaments, are planned, plus there is no rubberbanding and the multiplayer matches work rather well on the technical side. If you're NBA Jam or NBA Street veteran and consider yourself to have some talent when it comes to shooting a basketball with a controller, chances are you will enjoy NBA Playgrounds. The handling is responsive, and if you know what you’re doing, all blame and praise will be on you, the player. For players that need a shot meter and a practice mode to have a learning experience free of frustration, NBA Playgrounds will be a mixed bag, because while playful in appearance, getting good will take time, practice and research. For some this is a good thing, but others will find the lack of visual indicators frustrating and feel clueless about how to improve. As of patch 1.1.1 there's a shot meter in the game now which can be toggled on or off. This will prove to be a great help to anyone struggling with their consistency when shooting the basketball (such as me). Additionally a challenge mode has been added in patch 1.1.0, and from what I'm picking up at the forums playing with up to four controllers connected to one PC is also possible now. With those two main flaws gone, NBA Playgrounds is even better now. 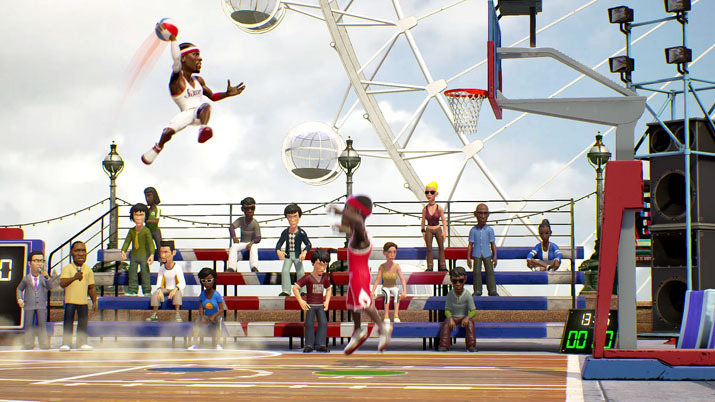 With some awesome NBA action to make and witness, NBA Playgrounds is an enjoyable game especially during first quarters. Yet in its current state, players might fail to take it to overtime. Better visual indicators and additional multiplayer modes are a must, and cross-platform matchmaking improvements would speed up the process. Nonetheless, NBA Playgrounds’ foundation is as solid as it is fun and fills a painfully neglected niche for PC. If you’re interested in easy to play, hard to master arcade sports games, give this one a try.